The study of public opinion and voting behaviour is one of the most academically advanced areas in political science and the wider social sciences. It is an evolving sub-field, both in terms of theoretical focus and in particular, technical developments and has made a considerable impact on public understanding of core components of liberal democracies: competitive elections and the aggregation of interests. The Routledge Handbook of Public Opinion and Voting Behaviour details the key developments and state of the art research across the public opinion and voting behaviour. It provides both an advanced level overview of each core area and engages in debate about the relative merits of differing approaches in a comprehensive and accessible way. As such, it will be a key reference point both for advanced level students developing knowledge about these subfields, as well as researchers producing new material in these sub-fields and beyond. It brings geographical scope and depth, with comparative chapters that draw on material from across the globe. The book is structured into ten sections: six on voting, three on public opinion and one on methodological developments. 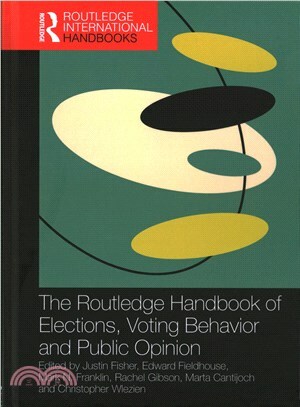 The Routledge Handbook of Public Opinion and Voting Behaviour is an authoritative and key reference text for students, academics and researchers engaged in the study of public opinion and voting behaviour. Justin Fisher first lectured at London Guildhall University. He was made Senior Lecturer at Brunel in 2003 and then Professor of Political Science in 2006. After serving as Head of Politics & History (2004-2007), he was appointed Director of the Magna Carta Institute in 2009 and combined that role with being Deputy Head of School for Research. Hewas appointed Head of the School of Social Sciences at Brunel in January 2012. The editors overall are uniquely well-placed to produce a high quality and highly regard volume, as the past and present editorial teams of the Journal of Elections, Public Opinion & Parties. JEPOP is an established international journal, publishing articles of the highest academic quality in sub-fields directly relevant to this handbook. It is the journal of the Elections, Public Opinion & Parties Specialist Group of the Political Studies Association. This group is the most active and longstanding academic association devoted to the study of voting behaviour and public opinion. Overall, therefore, the editorial team is highly likely to be able to recruit high quality contributions with a geographic spread that will enhance market performance of the handbook.